For a point data set with temperature data I have, I want to create their Thiessen Polygons in R. So far, the only algorithm I have found is that of Carson Farmer (http://carsonfarmer.com/2009/09/voronoi-polygons-with-r/). I would like to know if there is a ready to use function that creates Thiessn Polygons? 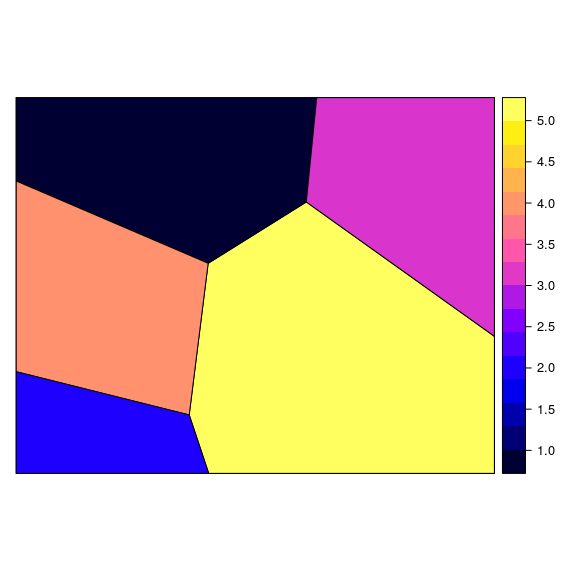 Thiessen polygons are Voronoi diagrams - there is a 'voronoi' package available in the CRAN archives (not the main repository), but the 'deldir' package does the same job. # Calculate the Delaunay triangulation, then the tiles. .. ..- attr(*, "names")= chr [1:2] "x" "y"
Alternatively, you could use dismo package. It accepts SpatialPoints* or matrix as input data. Not the answer you're looking for? Browse other questions tagged r voronoi-thiessen or ask your own question. R, given a set of center points how to define the cell area? Can Voronoi/Thiessen polygons be created using ArcObjects without 3D Analyst license? 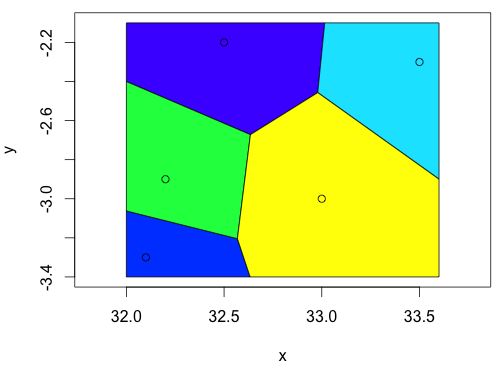 Create Thiessen polygons using spatially weighted averages? R: Voronoi tesselation from long/lat data?